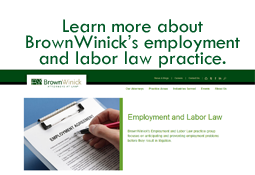 Workplace Wise - BrownWinick Employment Law Blog: Allergic to Work? Generally, when it comes to workplace health issues, we think of the Occupational Health and Safety Administration (OSHA). OSHA regulates toxic substances and air contaminants in the workplace, but does not specifically focus on allergens. Often, these regulatory limits are not low enough to prevent allergic reactions. So, if OSHA doesn’t cover it – does an employer need to bother with this? Simply put, yes. Under the Americans with Disabilities Act (ADA), a person with a disability is someone with a physical or mental impairment (or a record of such impairment) that substantially limits a major life activity. Major life activities (MLA) include caring for oneself, performing manual tasks, seeing, hearing, eating, sleeping, walking, standing, sitting, reaching, lifting, bending, speaking, breathing, learning, reading, concentrating, thinking, communicating, interacting with others, and working. MLA’s also include the operation of a major bodily function – like the immune system, special sense organs and skin, normal cell growth, digestive, genitourinary, bowel, bladder, neurological, brain, respiratory, circulatory, cardiovascular, endocrine, hemic, lymphatic, musculoskeletal, and reproductive functions. Allergies can bring employees within the protection of the ADA. Therefore, if an employee is having an allergic reaction to something in the workplace, employers have to employ the traditional ADA analysis as to whether a reasonable accommodation can be provided to the employee. First – try to find the allergen in the workplace and remove it. Increased ventilation and/or improved equipment design can be used to lessen or eradicate the exposure (reduce vapors, splashes, etc.) If the allergen cannot be removed or depleted enough, employers can accommodate the allergic employee with individual protections – such as protective clothing, barrier creams for the skin and respirators. But, OSHA regulations should not be forgotten. For example, if an employee needs a respirator, the employer must still comply with OSHA’s Respiratory Protection Standard to determine whether an employee could wear a respirator. If the accommodation needed by an allergic employee would create an undue hardship on the employer, it is not required under the ADA. Undue hardship can be difficult to prove and should be carefully considered by employers along with legal counsel.